All Rights Reserved 2010 Culinary Adventured of Fork, Knife & Spoon Photos and Content May Not be Copied or Used Without Clearly Expressed Consent of Author. Fork and Strawberry Fork have been trying to make a play date for ages. Something – or someone – always gets in the way. We are both MAD for fried chicken. And when I received an email from Seersucker letting me know that every Tuesday is Fried Chicken night, the necessity for a play date became far more urgent! They don’t take reservations. Strawberry Fork and I arrived just before 6:00 on a Tuesday night and were let in at just after 6:00. Slowly but surely every table was full and people were waiting at the bar and outside. Even with this crowd, you are never rushed or pushed out the door. The staff is very friendly and knowledgable about the menu. They are ready with suggestions, but don’t hover over the table while you’re deciding. There is both sparkling water and tap water available. 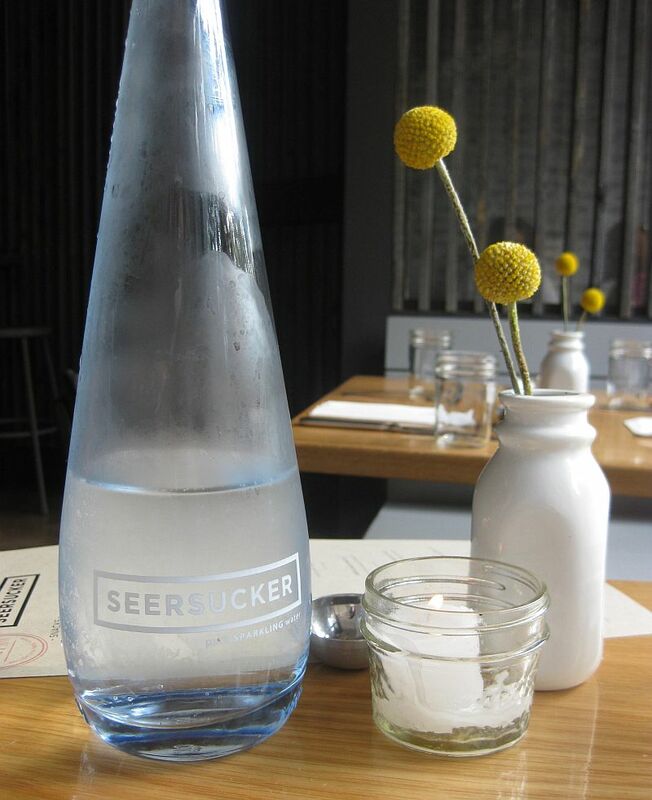 The sparkling is free and very crisp, served in a great light blue bottle that is constantly refilled. As a starter, we shared the Southern Snack Tray. 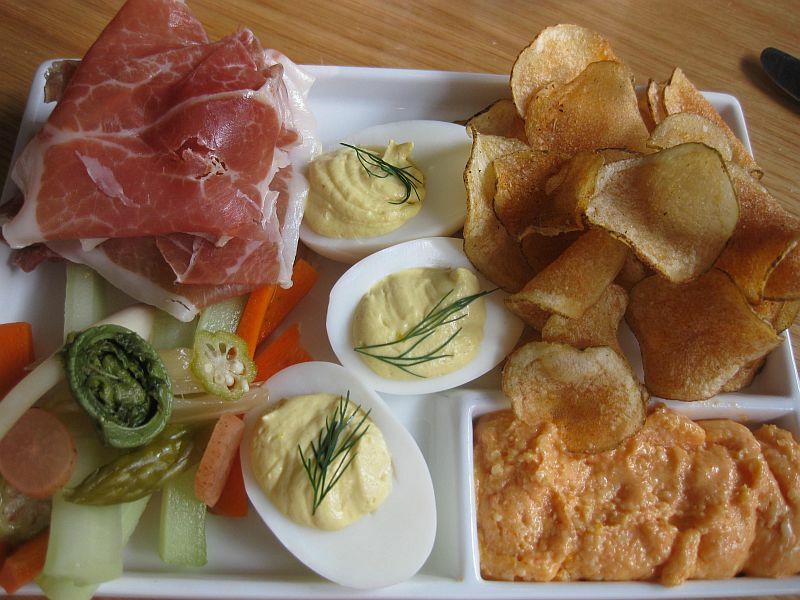 a large rectangular plate arrived laden with goodies – Surryano Ham, deviled eggs, pickled veggies, crudite, homemade chips and pimento cheese. The deviled eggs were great, creamy and slightly spicy. The pickled veggies were great, but you really can keep pickled okra. It is more slimy pickled – if that can possible be. Surryano Ham is simply a domestic version Serrano ham and nice with the deviled eggs and pickled veggies. The homemade chips were crisp and salty and perfect for scooping up the pimento cheese – which I had convinced myself – taste untasted – would be awful. It was far from awful. As a matter of fact it was pretty darn good – spicy, the pimento flavor really coming through, nice sharp cheese flavor. Needless to say, we both had the Fried Chicken. This week’s fried chicken was a spicy fried chicken – and spicy it was. A half chicken, fried with a crispy crust and moist and tender on the inside, served on a slice of white bread – I wish I knew what the white bread was for, but that’s besides the point! Along side the fabulous fried chicken were 2 sides – savoy cabbage slaw and potato salad. The potato salad was nothing to write home about. The savoy cabbage slaw was slightly sweet, crunchy and cool. Really nice with the heat of the fried chicken. We decided to share a dessert. We ordered the Salted Chocolate Brownie with Bourbon Caramel and Vanilla Ice Cream. Not enough caramel. I don’t think the brownie was salted, but the caramel. It wasn’t bad, it just wasn’t great. The better choice would have been the skillet pecan pie. It looked amazing! 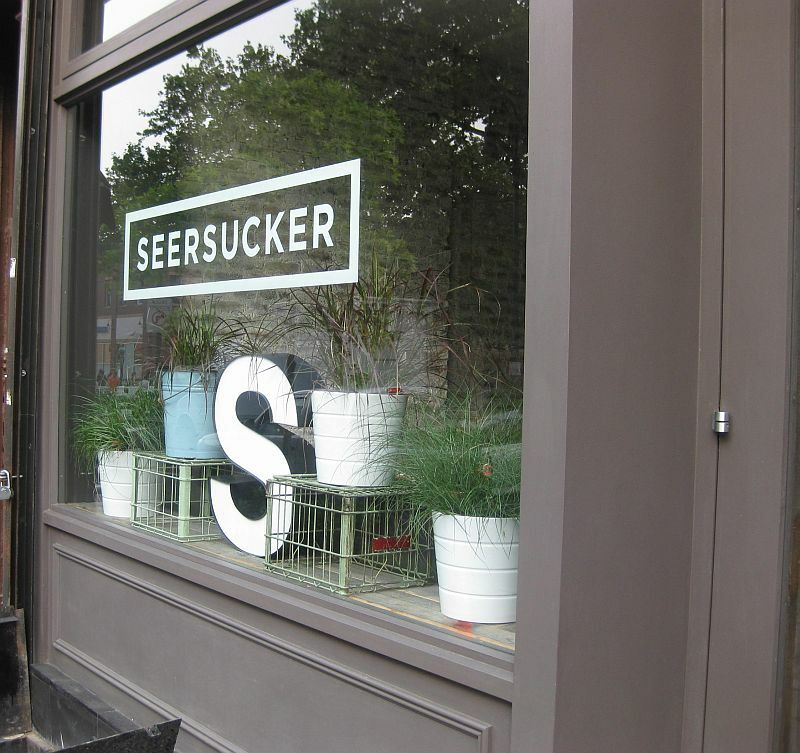 Although Seersucker is only open for dinner Monday through Saturday and for brunch on Saturday and Sunday, it is totally worth the time you may need to wait for a table. 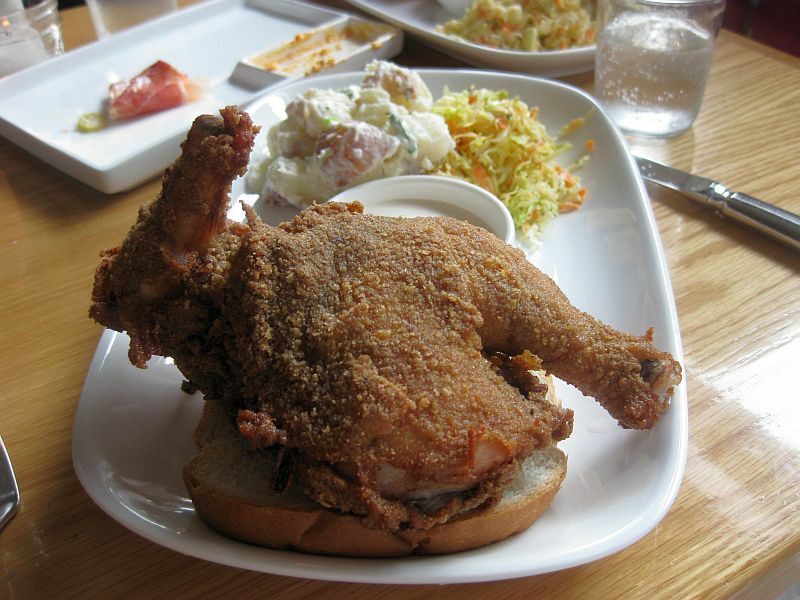 Oh man this looks great you got me craving fried chicken now!…I am pretty sure the white bread is to soak up any excess oil from the fried chicken. Kind of like an edible paper towel if you will. My MIL used to lie her chicken right out of the oil atop slices of white bread…I could be wrong, but that makes sense to me. Oh boy, fried chicken! The meal sounded yummy except for the dessert. 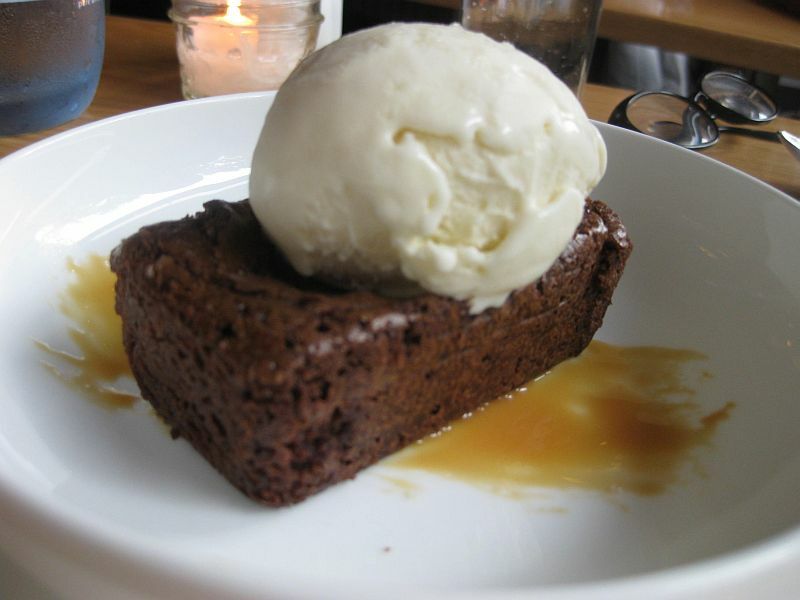 I like something wet with a brownie because some brownies can be dry — either more sauce or ice cream that will melt over the brownie. From the reviews that I’ve read, I like the fact that when you feel that something isn’t up to snuff, you explain why. That’s what the reader wants to know!